The Helix LT guitar processor features the same advanced HX Modeling technology found in the Helix Floor and Helix Rack processors. With a streamlined I/O complement and hardware configuration, the Helix LT guitar processor delivers the highest levels of performance, flexibility and control in its class. The award-winning HX Modeling engine leverages powerful dual-DSP performance to capture and recreate amps, cabs, mics and effects with authenticity and responsiveness. A large LCD and touch-sensitive footswitches with color LED rings enable easy usage and fast, smart control. The generous I/O complement, with extensive routing capabilities, makes it easy to integrate Helix LT into an existing rig and provides flexibility for a wide range of stage and studio applications. Helix LT has preset compatibility with existing Helix products and also offers Variax® guitar control integration. With Helix LT, the world’s most powerful guitar processing platform is now more accessible than ever before. Powered by the HX Modeling engine, Helix LT offers greater DSP power than any other multi-effects processor in its class. Tube amplifiers are recreated with authentic sound and feel—each amp component has been captured, measured and matched to the real thing. Mics, cabs and effects are recreated accurately and are designed to sound instantly recognizable if you’ve ever spent time in a studio. Helix LT also lets you load custom impulse responses to personalize your rig setup. With uncompromised Helix sound quality and 123 dB of dynamic range, Helix LT ensures an authentic and responsive playing experience. The Helix LT processor delivers the advanced user experience similar to the Helix Floor and Helix Rack processors, with a clear and intuitive interface that enables fast tone creation and easy interaction—all with a minimal learning curve and the elimination of complex menu diving. 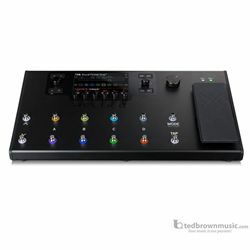 A large color LCD lays out the entire signal chain and provides instant access to amp and effects parameters. Helix LT features the same touch-sensitive footswitches as Helix Floor and Helix Control, allowing you to select an effect block for editing simply by touching it. Color LED rings enable you to know what is assigned to each footswitch at a glance. Helix LT also has four stereo paths per preset, allowing you to design complex routing scenarios for each patch. Part of the goal in developing the Helix family of products was to allow guitarists to interact with technology in ways that are more intuitive, making the creation of tones easier. This means you won’t have to stop playing to tweak a knob. With Pedal Edit Mode, you can edit any parameter you like using your foot; just select the block and parameter you want to change and adjust its value using the expression pedal.